The time is absolutely racing by, we can’t believe that we’ve been in Perth for a week already and only have three days until we move on! Seems crazy. We’re loving it though and are trying to make the most of each day without going too mad. Settled in completely now with our hosts and they are so friendly and have really let us have the run of their lovely house. They didn’t even mind too much when I cooked a couple of meals, although my ‘mash-up’ technique probably seemed a little strange to them. We’re complete locals too with the buses and the trains and smugly strut around as if we’ve lived here for years. I’m sure we’ll get our come-uppance at some stage but so far so good. I know Jo said that I would explain Aussie Rules football but I don’t think I can. All I know is it’s fast, there’s a lot of charging around, a lot of kicking the ball really high, too many goalposts, and a fair amount of fighting. Ok? 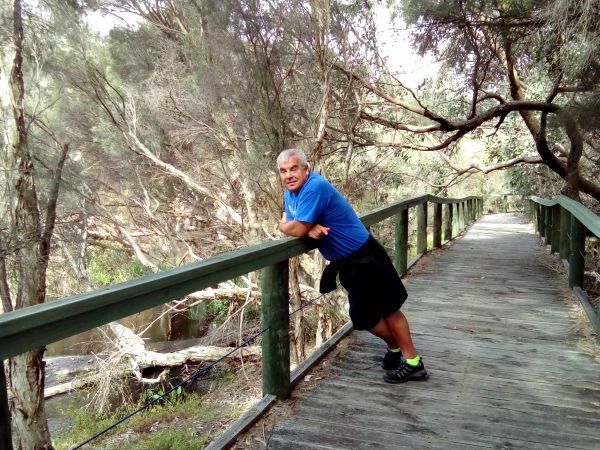 After our trip in to the city we decided we needed a bit of a local adventure so we headed out mid morning to the Canning River Regional Park which is pretty much over the road. A short walk to the visitors centre and coffee shop to stretch our legs seemed like a nice idea. It started well enough as we wandered round the River Park in a westerly direction (I used to be a cartographer you know) and found the coffee shop easily. Couple of cappucinos and a bun later and we were off. I’d checked the map before we left, roughly, and thought we could continue round the reserve to get back home. As long as we kept the place on our left and kept turning left we’d be fine obviously. Now I may not have mentioned that this river park is a little wilder than most other parks we’ve visited. 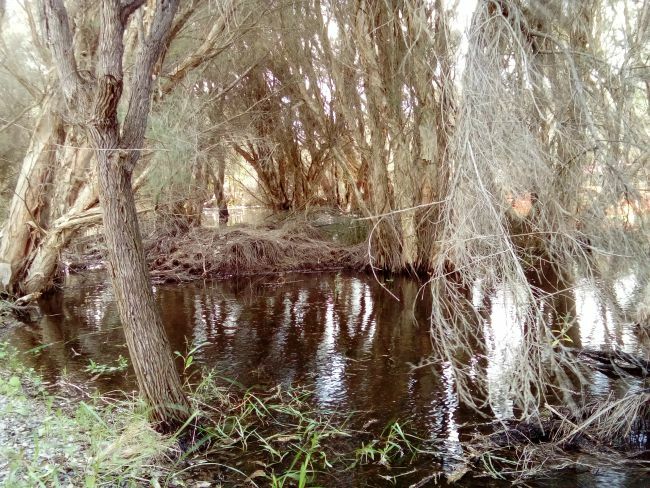 The centre of it is the Canning River surrounded by a huge swamp area containing wild birds and reptiles. Oh, and no signs whatsoever! So we wandered through the swamp for a while, turning left and looking for something we recognised (unlikely as we’d only been here for 4 days). 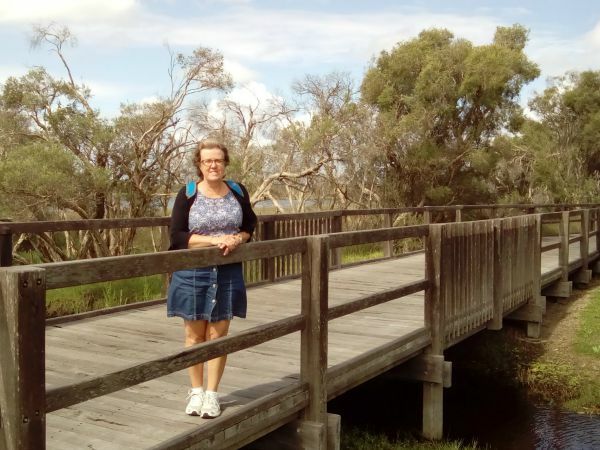 Lots of wild birds such as the fabulously named Laughing Kookaburra and the Grey Butcherbird played all around us and we even saw a few Willie Wagtails. On we walked, still turning left whenever we could down nice paths and not-so-nice paths with swamp all around. (Canning River Regional Park Birds ). We were fine, a bit tired, until we started to see the first signs. Each of them warning signs. Each of them warning against snakes! Great. Minutes turned into hours and still we couldn’t get out of the swamp. We had been walking for 3 or 4 hours by this point and my cartographers-inbuilt-direction-finder was shot to pieces, we were starting to worry. More weird birds such as Rainbow Lorikeets and Galahs watched us as we passed. We did meet one guy with a dog but he was from Newcastle and didn’t have a clue where we were. Eventually we met a jogging couple, who I will call Benny and Brenda (don’t know why, that’s just what they’re called). They weren’t a lot of help, I think they were a little scared to be honest and just wanted to get away, but they pointed us in the right direction and we made it to a different visitors centre. We made it home about 5 hours after leaving having walked between 7 and 8 miles. We’d only popped out for a coffee! Our trip the following day had to be easier as we headed by train out from Perth to the town of Cottesloe. The sun was shining and we had a bagful of buns so we were happy as a couple of Laughing Kookaburras. 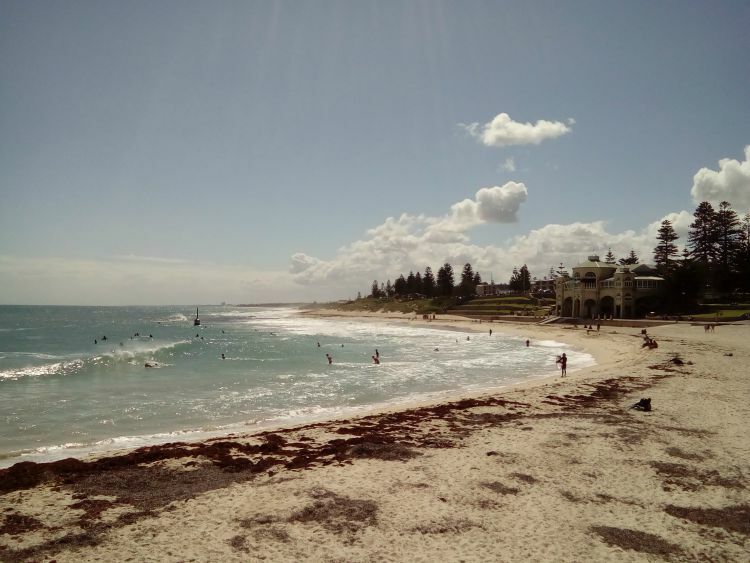 Cottesloe is the beach resort of Perth so easy to get to and absolutely stunning. First stop the beach and within minutes we were paddling in the Indian Ocean. It made us think again about how far we’d come. I got a bit excited with the paddling unfortunately as the waves crashed over me up to my waist soaking my shorts! Looked a bit embarrassing as we walked along the beach later. Loads of surfers trying to find the perfect wave and a few actually swimming but the water was a trifle cold, it’s still early spring here so not really beachtime yet. We wandered up to watch a big surfing competition on the next beach and mingled with the tanned and beautiful sandgropers as they ate kangaroo steaks, drank Hahn beer and went deaf to the sound of techno. We were obviously not quite in the right age bracket though. A beautiful walk up the coast followed by a couple of Hahn Super Drys at the Beach Club in the Cottesloe Beach Hotel was absolutely perfect though. As we sat and watched the muscle cars cruise by and the kite surfers leap and turn we couldn’t believe how we got to be in this fabulous place. 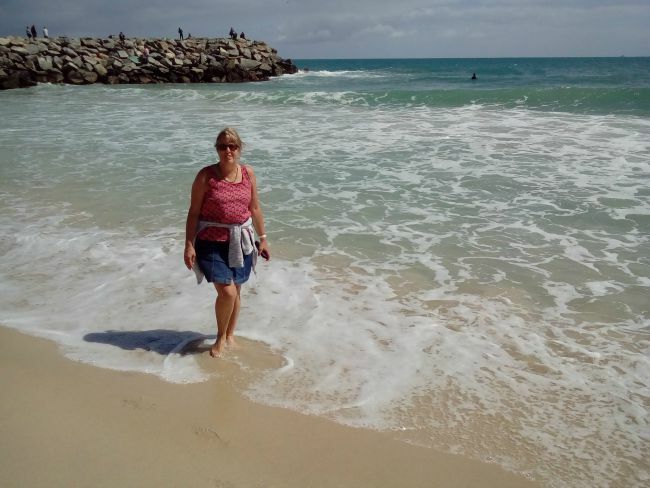 One of the locations that we had really wanted to visit was Fremantle. It’s on the coast at the mouth of the Swan River that leads inland to Perth. Fremantle is the place where Britain used to send convicts to in the 1800s and we were interested in the history of the place. 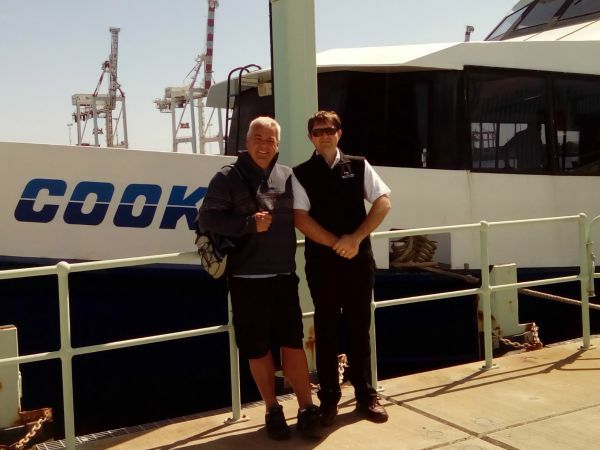 So we got into the city early and booked our places on the Captain Cook ferry. What else could it be? 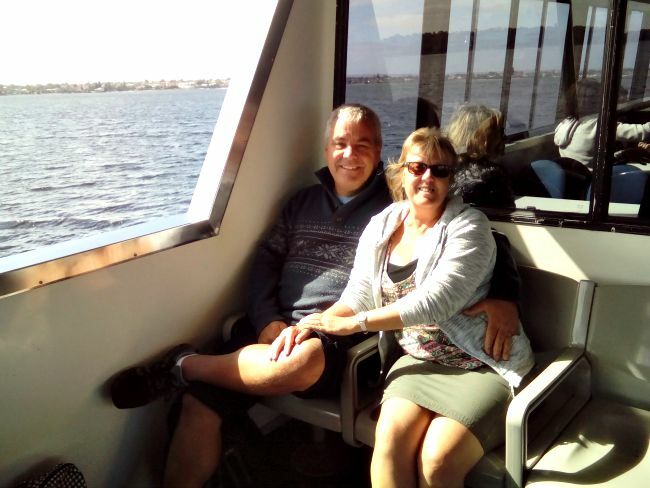 We set sail from the Barrack Street Jetty and wound our way up the Swan River past harbours and marinas and hundreds of million-dollar boats and houses. 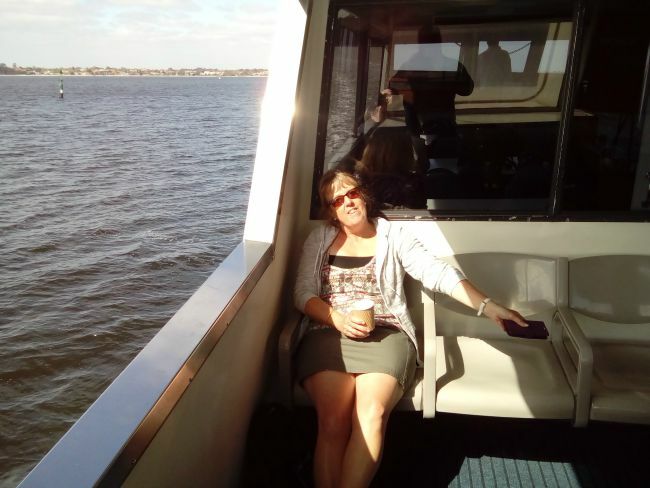 Jo was very interested in the free tea and coffee on board of course, and we both loved seeing the dolphins swimming alongside us up the river. We had expected Fremantle to be a quaint little fishing type of place but it was completely different. It seemed to be New Orleans by the sea in fact, the whole town full of original low level buildings oozing with character and stories at every turn. 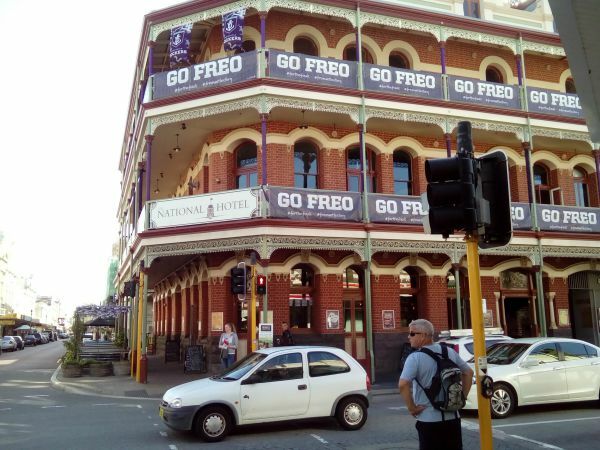 Everyone calls it Freo here, took us a while to realise that all of the signs said ‘Go Freo’ and not ‘Go Fred’. We were wondering who on earth Fred was and where he was going! 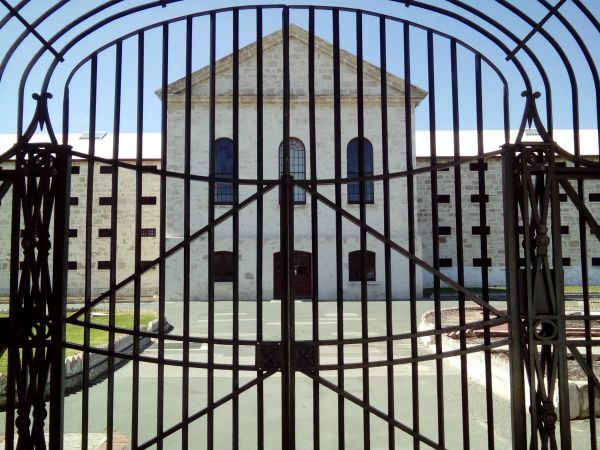 Our first stop in Freo was the prison. I’ll try and ‘Do a Jo’ now and give you a potted history. Built in 1851 to house convicts from Great Britain it was initially requested by the locals as they needed labour to develop their town. This worked well for a few years until the convicts stopped coming in 1886 so they turned it into a high security jail for Western Australia which was in use until 1991. Now its open to visitors so we visited and spent a few hours learning all about its secrets. We fell in love with Fremantle though, just loved the atmosphere and the history and the sort of hippy attitude it appeared to portray. My problem was that I wanted to go in every single bar that we passed, they all looked so inviting. Every one had flags and banners supporting their Aussie Rules side Fremantle Dockers, who have just reached the finals of the National League (big game Friday night). 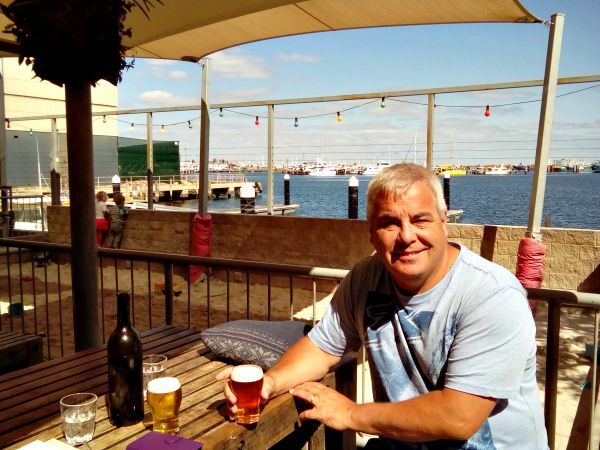 We decided on the well-known Little Creatures brewbar on the harbour. Stocked with it’s own beers and with a fullsize pizza oven beside the bar we enjoyed a lovely couple of local beers in the sunshine. Better than perfect. Although we only have a couple of days left here on the West coast we are definitely having one more day in Fremantle before we leave. Some of those bars are just calling our names too loudly ……. Oh, and we have a little problem which we’d love some help with. Another good blog…the beach looks and sounds right up our street, if only we were there with you having fun, exploring and of course kite surfing….! Jo is now having a crisis caused by you suggesting she’s having a mid life crisis! Continental Explorers sounds ok, still not quite right though. Definitely not travelling. Sounds like a good idea Mandy. We’ll just say ‘No we’re not on holiday, we’re LOD’ !! Feel like we should have a basketball if we’re Globetrotters. We do a lot of wandering though, most recently in swamps! And you said that you couldn’t explain Aussie Rules Football? A finer description I have never read! I think it was only a vest reference away from textbook. How about saying you are on a belated University gap year? GAP years consist of all night drinking and all day sleeping don’t they? And Aussie Rules is just nuts to be honest. Great to watch though! 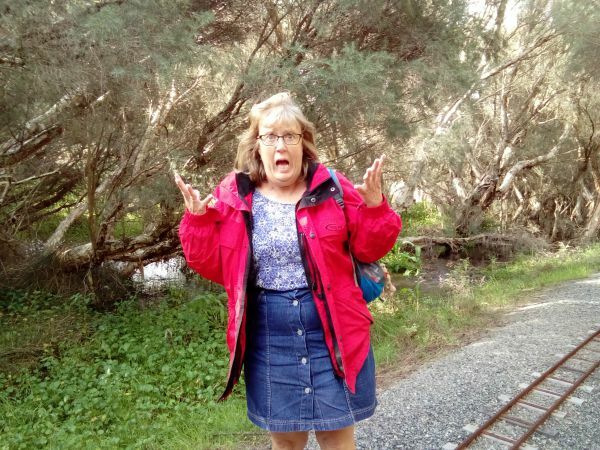 What a cracking start to your Antipodean adventure. There is something about the momentum of travel that makes you want to just keep moving, to never stop.So said Bill Bryson and it’s so true. Why don’t you tell everyone that you are Independent International Travel Consultants (IITC) on an assignment for a major travel company. Be safe. and there was me thinking we were being stalked by a load of Star Wars fans with JaJa (Binks) in their T-shirts! Nomad was a bit harsh as you are not roaming for pasture but always seem to be grazing on beer and cakes!!! I think you should just say practicing for retirement !! You get one on an iPhone as standard!!! Love “Go Fred” I think you should use that as a secret code at some point! 1. Trying to see how many bars we can visit and buns we can eat in 365 days. 3. Being ourselves and enjoying ourselves. 5. In the words of Holly Golilighty “Just travelling”. 6. Having an amazing, fabulous (any adjectives you wish to insert) time. That’s enough to be going on with lol. 1. Absolutely having it large! Just had a bit of read of the last few blogs. Glad you’re both enjoying Australia so far! Cheers Ben. We’re having the time of our lives. Best decision we ever made to take this little trip. Great post! Of course I am biased as Perth is where I grew up, I haven’t been there since 2012. Sounds like you are having the adventure of a lifetime, looking forward to hearing about more. You could just tell folks you decided to “go walkabout”. We tell people all sorts of stuff! Some of it true. Out favourite description is that we are ‘Land Sailing’.